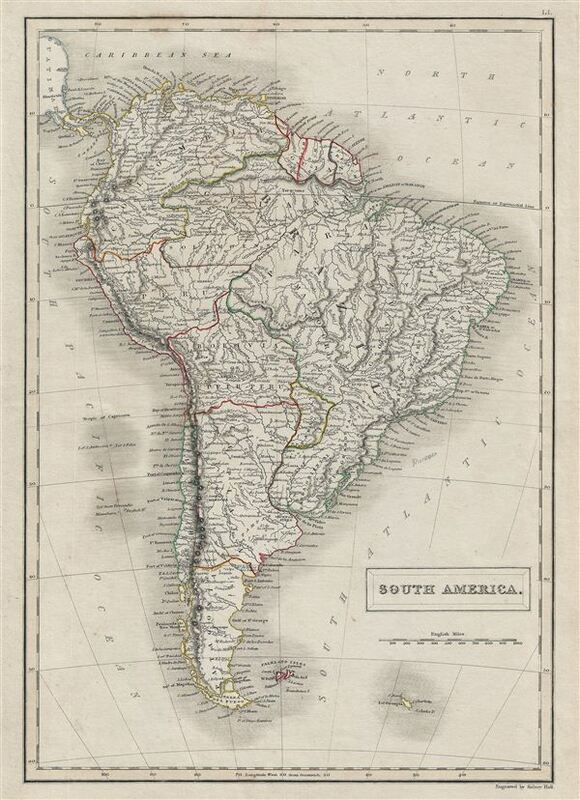 A fine example of Adam and Charles Black's 1840 map of South America. The map covers the entire continent from the Panama Canal to the Falkland and the South Georgia Islands. It includes Colombia, Guiana, Brazil, Peru, Bolivia, Paraguay, La Plata, Patagonia and the Falkland Islands. During this time in history most of the continent was struggling for independence and national solidarity. Led by Simon Bolivar of Venezuela and Jose de San Martin of Argentina, most of the Spanish colonies in South America won their independence by 1823. In Brazil, Dom Pedro I became first emperor after proclaiming the country' independence in 1822. Guyana is shown with British, French and Dutch divisions. This map was engraved by S. Hall for issue in the 1840 edition of Black's General Atlas.